Since 1997, KP and the Coalition of Kaiser Permanente Unions have been part of an innovative relationship that is known as the Labor-Management Partnership (LMP). The LMP involves employees and unions in organizational decision making at every level. The LMP is designed to improve the quality of health care, make KP a better place to work, and expand KP’s membership. A central principle of the LMP is that those who do the work every day understand the challenges of the job and can come up with innovative solutions. 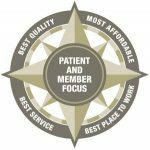 On a day-to-day basis, the LMP means that professionals, workers, managers, and physicians use a joint decision making and a problem-solving process based on common interests. This approach gives professionals the dignity and respect we deserve as experts in our fields, and allows for stronger protection and advocacy for our professions.